As pointed out in a recent post, teaming up with startups provides an opportunity for established firms to drive innovation without risking major interference with their core businesses. Particularly, with regard to radical or disruptive innovation, investing in startup incubators, accelerators or corporate venturing increases the chance to get access to promising novel technologies and business models. On the other hand, by engaging with established firms, a startup acquires capabilities to develop and scale their business, e.g. supply chain and production capacity, sales and marketing channels and last but not least an existing customer base. But what kind of engagment with new ventures should be pursued? And how to handle a startup after an acquistion? Should it be integrated or left as a stand-alone unit? Answering these questions properly is going to have a significant impact on the likelihood of success of those activities. So far, it looks like many of the run corporate new venture activities don’t live up to their expectations yet. Both articles provide useful insights and I would like to reference some of their key points here. Though, I recommend reading the entire articles for more comprehensive information and further details. Which new venture tool/engagement to choose? 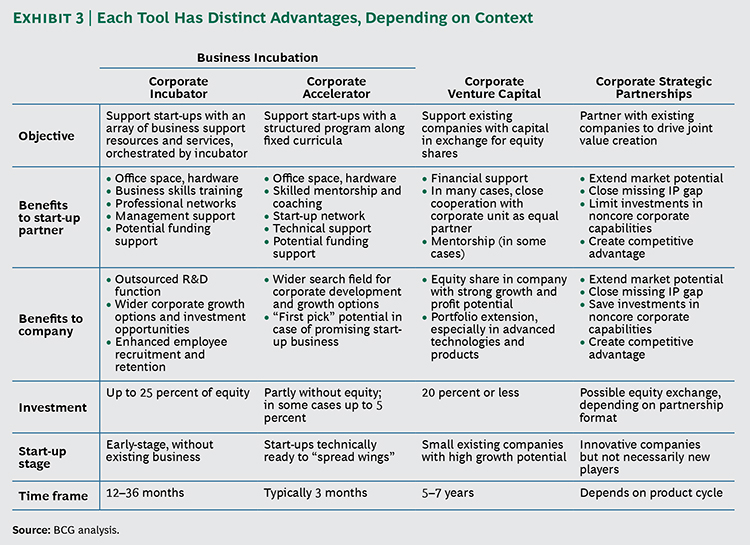 BCG points out, that used in concert, the identified innovation tools (see exhibit below) enable companies to take a holistic view of growth that encompasses core, adjacent, and noncore activities; that accommodates diverse methods of collaboration and startup support; and that allows for different rates of development in different spheres. Some forward-looking companies are already using all or some of this suite of tools to gain an edge in today’s hypercompetitive environment. Energy companies are experimenting with new business models in the new renewable-energy field. 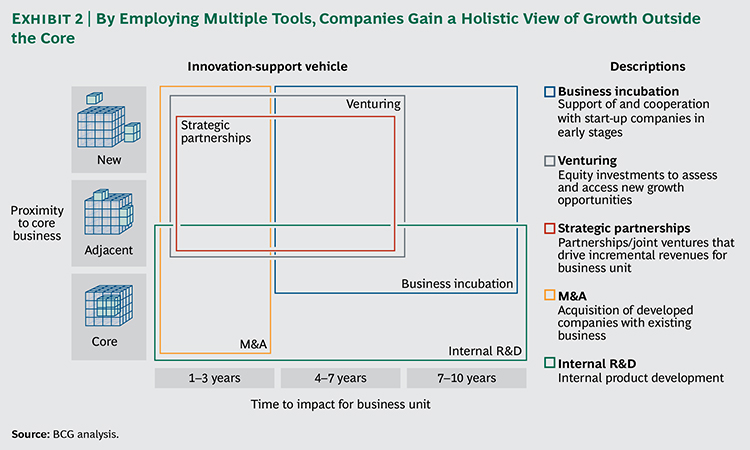 Automotive companies are expanding their product portfolios and broadening their ecosystems through investments in mobility systems and new financing models. Pharmaceutical companies are branching into new business areas such as nutrition products. 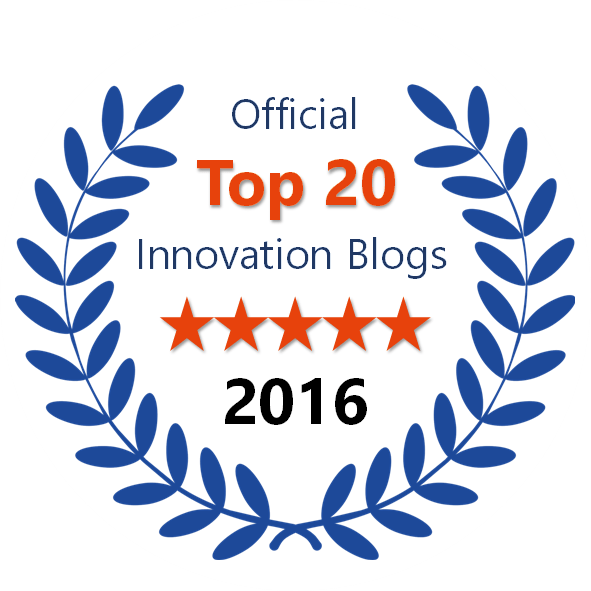 In each case, companies are leveraging their business-incubation, venturing, and partnership activities to widen their search fields and find innovations in corners of the business world that they had not previously explored. When correctly applied, these tools enable companies to engage with other organizations in various stages of development, from startups still in product development to companies in their early growth stages to mature enterprises. They also enable companies to commit to a range of time horizons with varying levels of financial investment. 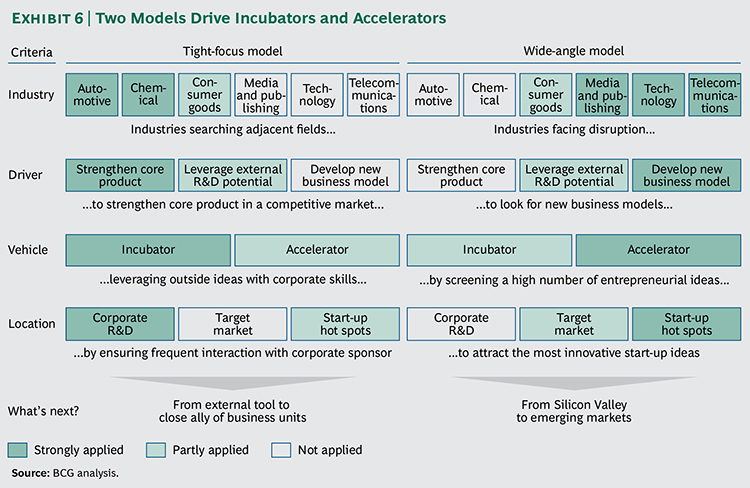 In the quest for innovation, many companies have recently raised their game by means of incubators and accelerators. These tools allow them to engage with early-stage startups either over a relatively lengthy period of intensive business development or through a shorter-term structured curriculum. In this respect, they differ from venture investing, which focuses on more mature startups, and from strategic partnerships, which facilitate the rapid introduction of new products or services leveraging mature technology. Incubators enable companies to support and collaborate with a handful of promising startups for as long as three years. Sponsoring companies make equity investments of as much as 25 percent and afford the startups access to corporate resources and facilities. The startups selected for incubation have significant interactions with their corporate sponsor, at both the corporate and business-unit levels. Accelerators, in contrast, enable rapid screening of a large number of startups focused on a particular technology or region. Support takes the form of a structured business-development curriculum for a fixed term (typically, three months). The startups invited to participate in the accelerator are usually on the verge of launching revenue-generating activities, and the corporate sponsor promotes their development by granting them access to office space, technical support, high-quality mentoring, networks of other startups, and funding sources. 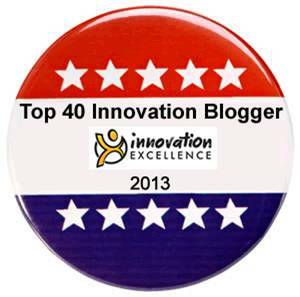 In return, the company gains early access to promising ideas and companies. The corporate sponsor typically makes no equity investment in the startups, and interaction at the corporate and business-unit level is limited. Some companies, though, will take small equity stakes (5 percent or less) to lock in access to an especially promising venture. Is the new venture at the stage of searching or executing? Steve Blank notes: Startups are those companies that are still in the process of searching for a business model. Ventures that are further along and now executing their business model are no longer startups, they are now early-stage companies. Large corporations come to the valley to looking to acquire both startups which are searching for a business model and early-stage companies which are executing. Companies that acquire startups for their intellectual property, teams or product lines are acquiring startups that are still searching for a business model. If they acquire later stage companies who already have users/customers and/or a predictable revenue stream, they are acquiring companies which are executing. Separating or integrating a new venture? Again, here is what Steve Blank suggests: It turns out the success of the acquisition depends on whether the acquiring company intends to keep the new venture as a standalone division or integrate and assimilate it into the corporation. If the startup is being acquired for its intellectual property and/or team, the right strategy is to integrate and assimilate it quickly. The rest is just overhead surrounding what is the core value to the acquiring company. What objective/purpose is pursued with the engagement? 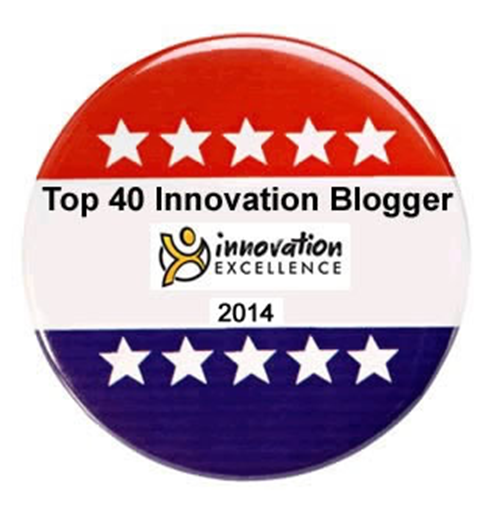 Which innovation horizon (core, adjacent, new) shall be addressed? When is the financial impact be expected? Accordingly, appropriate engagement tools, investment, time frame and targets need to be determined. 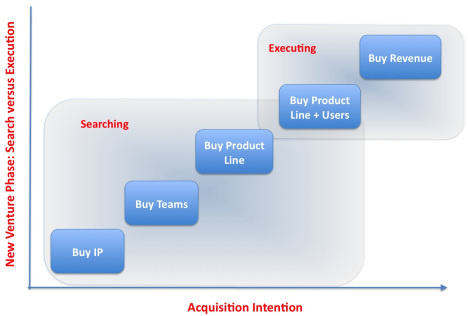 Is a new venture target in a search or execution stage? Ventures in search mode require different structures, processes, resources and management style than executing ventures. Is a venture acquired for its IP, talent or revenue? Then it should be rapidly integrated into the acquiring firm. 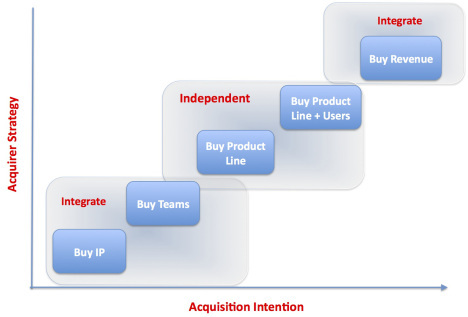 Is a venture acquired for its products, business model and/or users? Then preserve its culture by keeping it separated from the acquiring firm. Complementing large and small firm capabilities through engagement in ecosystems – if done right – is going to be a major path to innovation in the time to come. Neat summary Ralph, and there was me thinking that corporates only ventured with start-ups for brand and CSR… (that is a joke)! Thanks Richard. Indeed, I think engagement with new ventures/startups is going to be an increasingly important path to innovation for established firms. Interestingly, lean startup principles are to be applied for internal as well as external ventures.